Juliette Binoche has a new film coming out this week in limited release and much to my chagrin she costars with Channing Tatum and Katie Holmes. The Son of No One features Binoche alongside Tatum, Holmes, Al Pacino, and Tracey Morgan; quite the eclectic cast. But despite its hokey premise, it’ll hopefully remind American audiences of Binoche’s talents. Binoche’s career began in the early 80s in French films before having brief success in America, wherein she won an Academy Award for Best Supporting Actress in the film The English Patient. She has managed to maintain her profile in the States for a few years after that, as she scored another nomination five years later for the film Chocolat. But much like Tilda Swinton, her Academy Award victory has allowed those of the voting body to make do with acknowledging her talent, but ignore her work after the award. Not to go off on a complete tangent here, but it’s quite intriguing how there tends to be greater acknowledgement of the follies of one’s post-Oscar career rather than their success; Halle Barry is likely to never live down her role for Catwoman whereas Binoche and Swinton can string along career best performances without ever getting acknowledged by a voting body. But enough of that – this is meant to be celebratory. Maybe for the few who will check out The Son of No One, they can follow it up by one of the many undoubtedly better films starring Juliette Binoche. If there’s one collaboration I’d like to see more of, it’s between Michael Haneke and Juliette Binoche. The duo worked on two films in the aughts, and both brought out the best in each other. In their first collaboration, Binoche operates very closely under Haneke’s direction, wherein there’s a lingering sense of reality to the proceedings. Perhaps it’s what makes their work together so convincing, but the two serve to elevate tension by evoking an unprecedented sense of reality to the proceedings – through Haneke’s lens and Binoche’s face, you’re wrapped up in the chaos of the film. It’s only when Binoche is off-screen does the film show signs of fatigue. Dan in Real Life doesn’t make any revelatory statements or attempt to bring nuance to a tired genre, but what it lacks in its writing and direction, it makes up for a strong chemistry between its lead characters. Featuring Steve Carell in the title role, Binoche could have simply played his amiable love interest and left it at that. But she instills a sense of humanity to her character, wherein you immediately grasp why Steve Carell’s character would fall for her. Her work in the film is the sort of thing that elevates the whole picture above what it is; which is the only reason a film like The Son of No One would get my attention. Hsaio-Hsien creates a very quiet landscape for actors to operate under. Flight of the Red Balloon is no different from any of his other films, in so much that it’s very deliberate and subdued. For an actress like Binoche though, she manages to capture your attention while maintaining a splintering sense of modesty. She manages to evoke a sense of quirkiness in her performance while having a firm grasp of what Hsaio-Hsien hopes to achieve in his muted tone. Like her performance in Code: Unknown, Binoche gives herself to her director’s vision, testing herself as a result, and subsequently gives yet another sincere performance. 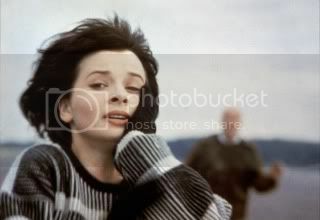 In a pivotal role, Mauvais Sang is one of the few examples of a more submissive Juliette Binoche. While her contemporary roles have her positioned as a stronger female character, it was these smaller, passive roles that allowed audiences to embrace Binoche. 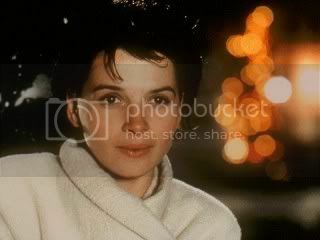 Almost mouse-like in her features, Binoche tends to be shot in a manner that always has her head slightly down and eyes looking up; it is a technique employed by Leos Carax to great effect, wherein you simply melt at Binoche’s subdued and naïve nature. Future roles would allow Binoche to develop a far more dimensional character, but this is the sort of role of such restrained physicality that it’s impossible not to be moved. The role. 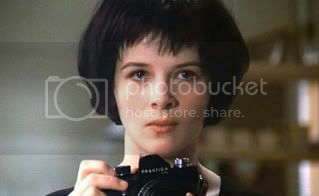 Juliette Binoche’s performance in The Unbearable Lightness of Being introduced her to American audiences, where she worked alongside Daniel Day-Lewis in an interesting take on Milan Kundera’s novel. The film is problematic: it’s gratingly long and questionably paced. But what makes the film work is the acting clinic on display. Both Binoche and Day-Lewis (with a dash of Lena Olin) lobby for acting space that fortunately has the room for it in its three-hour run-time. While not a success as a film, it’s an incredible example of how two actors can essentially sustain a film for a three-hour frame and make it look effortless. Oliver Assasyas’ Summer Hours employs Juliette Binoche in a similar manner that Hou Hsaio-Hsien did in Flight of the Red Balloon, though the world she inhabits is less meditative and more humanistic. That difference highlights a naturalistic quality that seems to emanate from Binoche – there’s a sense that she is just naturally disposed to being pleasant. And while she does relish in moments of bitchiness, the role is one that is largely calm and operates wonderfully under Assasyas’ restrained tone. It’s an interesting companion piece to The Unbearable Lightness of Being, wherein the twenty-year gap between films allows you to see how much control and restraint Binoche has developed over time. Perhaps my favorite Binoche film, The Lovers on the Bridge is the sort of goofy romance film that relishes in its melodrama while redefining what constitutes as melodrama. While both Binoche and her co-star, Denis Lavant, give strong performances, the film is largely a directorial effort. But in Leos Carax’s odd blend of romanticism, surrealism, and extravagance, both Binoche and Lavant are forced to play characters that are oddly devoid of history; in that, it seems like their performances are largely improvisational. The whimsy of the world that Carax constructs is beautiful, but it’s Binoche and Lavant who take all that romanticism and make something out of it. If there’s a film that can be used as a marker for a turning point in Binoche’s career, it would certainly be Cache. This is the first role that I’ve seen of hers where I no longer felt she was capable of playing the sort of innocent, naive role; as she has aged, she evokes a sense of prestige to every role she has taken. Subsequently, Cache has Binoche in a world-weary role where there’s no room for nativity as she becomes the victim of surveillance. It’s one of the few films that serves to address the mental psyche of a Binoche character, wherein she slowly recedes in her mental state. She realizes that descent with sincerity that evokes sympathy and horror. Part of what makes the film succeed, and what makes Binoche’s performance even more amazing, is the ambiguousness of Certified Copy’s narrative. The film’s central relationship is not clearly defined; the fact that Binoche only adds to the ambiguity and mystery of her relationship to William Shimell adds to how astute she is at controlling and restraining her performances. And as she is balancing the mystery, she engrosses us in Kiarostami’s mesmerizing dialogue, wherein she makes the most philosophical of conversations seem accessible to a layman. From her seamless integration of languages, to her weathered face as she applies make-up, Binoche gave one of her finest performances only a year ago. There have been roles like those in Three Colors: Blue before. It’s hardly an original work; a woman is widowed and contends with the loss. But there’s an approach to how both Kieslowski and Binoche approach the character that makes for a revelatory experience. Three Colors: Blue evokes the sense of guilt and loss felt by Binoche’s character through exquisite framing, but it’s Binoche, who seems to be exercising and mastering her craft. Her face still possesses that glow of innocence, but as the film progresses, it begins to harden. The restraint and command she has in her films of the aughts is unrefined; it’s a film that’s just as much about loss as it is about recklessness and unpredictability. The depth and layers of conflict that Kieslowski constructs for Binoche is unparallel; she responds with an equivalent performance.